Examples) A case where both a revisional double eyelid surgery , lateral canthoplasty and the Magic epicanthoplasty are done to make them refined and structurally harmonized. The revisional eyelid surgery is the most common revision surgery . As other common plastic surgeries, it is taken because of the unsatisfied outcome of the patient. So, the first surgery has to be done very prudently. And when considering a reoperation, the eyes have to be treated exceptionally carefully. And enough consultations should be taken. Depending on the type of surgery, the surgical methods and the recovery conditions differ. the surgical methods and the recovery conditions differ. There are two reasons people having their double eyelids reoperated. 1) When the patient may not be satisfied with his/her look, a subjective matter. 2) When it is needed to take the reoperation from an objective point of view. Awkward and unnatural eyes give a feeling of huge discomfort. This usually is caused by very poor surgical techniques and ignoring the anatomical structure of the patients’ eyes. It needs to be corrected, and the remaining Mongolian fold is mainly the other critical reason for it. The Magic epicanthoplasty with a double eyelid reoperation may be needed at the same time. Examples) A case where only the Magic epicanthoplasty is done on the awkward looking out-folder line to make them refined especially in inner corner region. 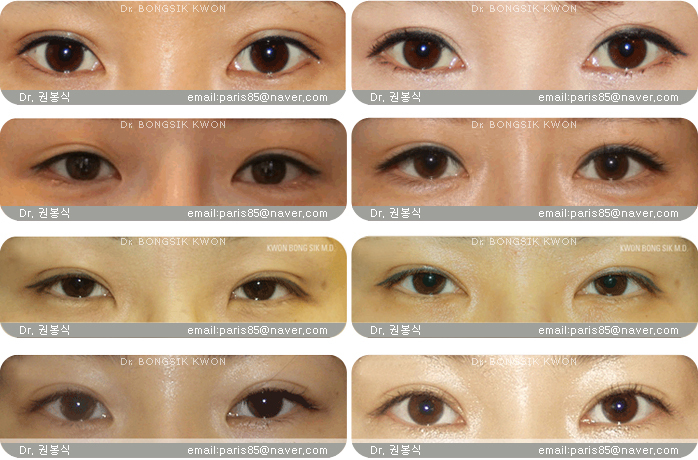 Examples) A case where a revisional double eyelid surgery is done to make them refined especially inner corner region. Examples) A case where both a revisional double eyelid surgery and the Magic epicanthoplasty are done to make them refined and structurally harmonized. Eyelids that are too close to the edge (small width of double eyelid). An eyelid that is too close to the edge of your eye’s skin can be corrected with surgery. In this case, an incision(including excision of skin) is necessary. 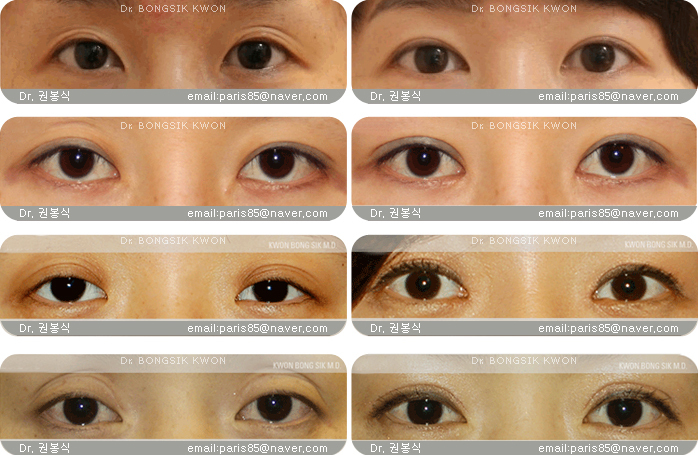 When the epicanthal fold is severe and a double eyelid is buried into the skin, a complex operation is needed. After fixing the epicanthal fold, more clear lines can be seen. 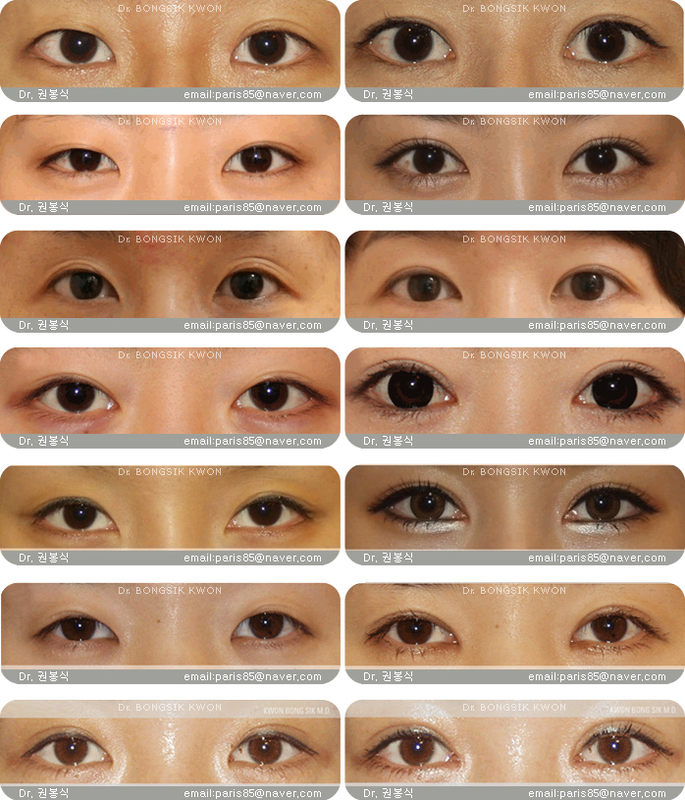 First, when the double eyelid line is weak, correction for it is needed into a more strong fixing method. Second, the Mongolian fold can be another critical reason. It is because of the Mongolian fold that hides the lines or weakening of the levator muscle, so the eyes look a little closed even though they are fully opened. By knowing these reasons and correcting it, proper lines can be maintained. No matter how beautiful the eyes, upon close inspection, the double eyelids will be slightly different. Due to the differences between each eye, it is important to find out whether the surgery will cause each eye to look different. For various reasons, the two eyes can look different for a period of several months due to either anesthesia or swelling. After the swelling is reduced for a month, we can determine whether it must be corrected. 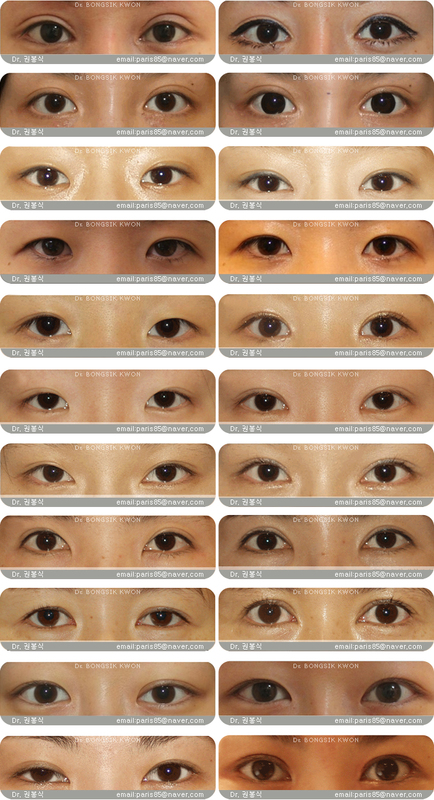 When the differences between the eyes are visible, it is usually due to the slight difference in the line of the double eyelid, or a difference between an in-folder and an out-folder which can be fixed with Magic epicanthoplasty. And in the case that the difference caused by exposure of the pupil, it is caused by ptosis only to one side, and can be solved by ptosis correction. When a double eyelid surgery is performed in eyes with ptosis, without ptosis correction, the ptosis can become more obvious. In a mild case, it is improved once swelling is reduced. If not, a second surgery is needed to fix the ptosis and then create a beautiful eye. After surgery, there may appear to be two lines, which are caused by excessive excision of the orbicularis oculi Muscle or the removal of too much fat. This can improve slowly and it is recommended that after three months if the problem still persists, that a second operation is performed. If it persists, it can be solved by adding fat as reoperation. As it is a mild problem, it can be sometimes solved by fat injection. If there is sufficient skin below the line, it can be removed and reattached. However, if this is not the case, it becomes more complicated. 3. When fixation of a double eyelid was too strong. Many patients usually worry about the sausage effect that makes the eyelid skin look thick and swollen. This is caused by the high location of the line. Unfixed Mongolian fold plays also an important role in forming the sausage appearance, because the swelling does not reduce easily. If the line is too high, it can be easily fixed within the period of a month, or after a period of 6 months. 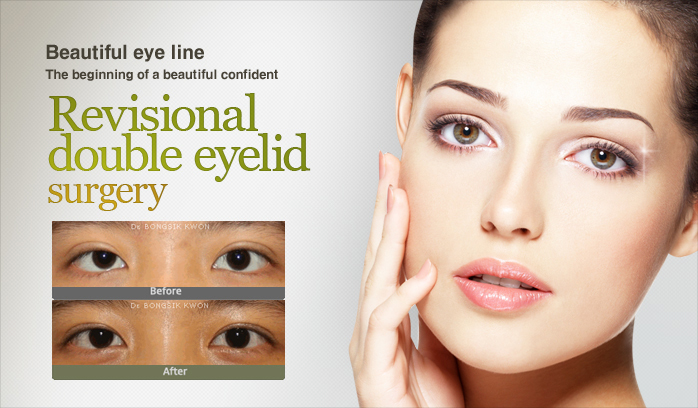 The most difficult thing when undergoing reoperation is to make thick double eyelids look more natural. There is, however, a limitation in the improvement. This means that it may not look perfect. The important thing is the presence of the extra skin between the lines and the eyelashes, which makes the lowering of the lines not that difficult. After the incision including the original surgical line, the part fixed too high is released and fixed again at the lower points. But in the case the double eyelid is too high, additional surgery is needed using the surrounding tissues or transplanting fat. In a case where the eyes don’t open easily, the ptosis is sometimes present and then the correction of it is needed. Scars can be usually seen on a double eyelid surgery by an incision, but when operation is performed by the buried suture method, there will be no scar at all. And even with incisions, scars are much smaller than the past. There are cases where scarring occurs because of bad treatment, inflammation or constitutional factors, but after 6 months scar revision or scar removal surgery can be done. When an upper eyelid looks swollen. The upper eyelid can look swollen when eyes have a thick eyelid, a deep eyeball socket, or when there is a short distance between eyebrows or thick brows, the brows hang low, or if there is a lot of fat in the eyelid. These conditions can be easily fixed with an operation if proper surgical plan is made before surgery. When the swelling does not reduce after an operation. This can be caused when the double eyelid is made too large and no skin is removed from the eyes. This may cause damage in the tissues or poor circulation, preventing the reduction of swelling. If there is no improvement within six months, the scar can be removed by reoperation. It has to be filled with fat because it is caused by the removal of too much of the orbital fat. Raised eyelashes gives a good looking but when fixed too high and strong, it can cause unnatural expression of the eyes. It can be easily weakened or lowered by surgery. 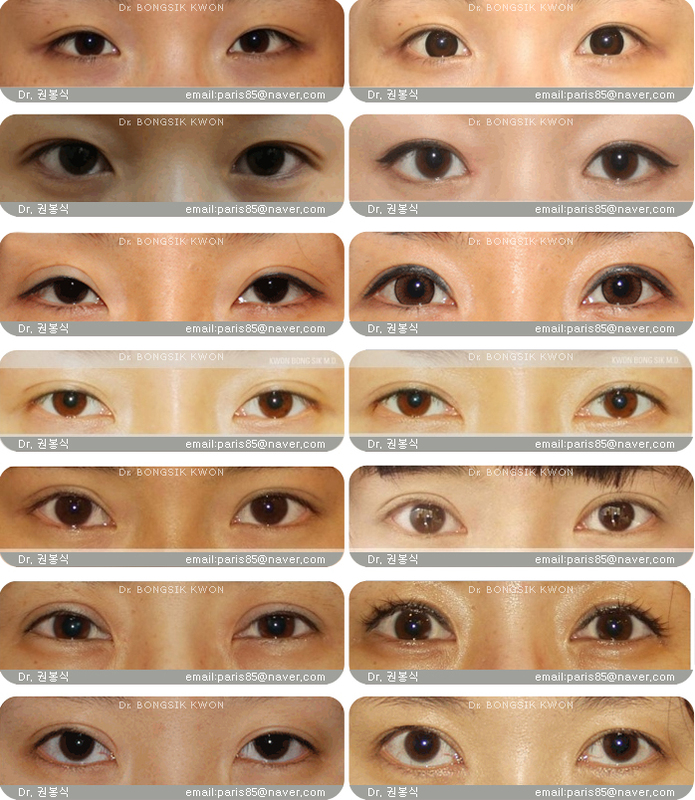 When performing a double eyelid surgery without improving hanging down skin or Mongolian fold, clear lines cannot be made, and only the middle and lateral part can form lines. This can make the eyes look wider from each other and make it look incomplete. Also, it can get loosened and become smaller gradually after ther surgery. 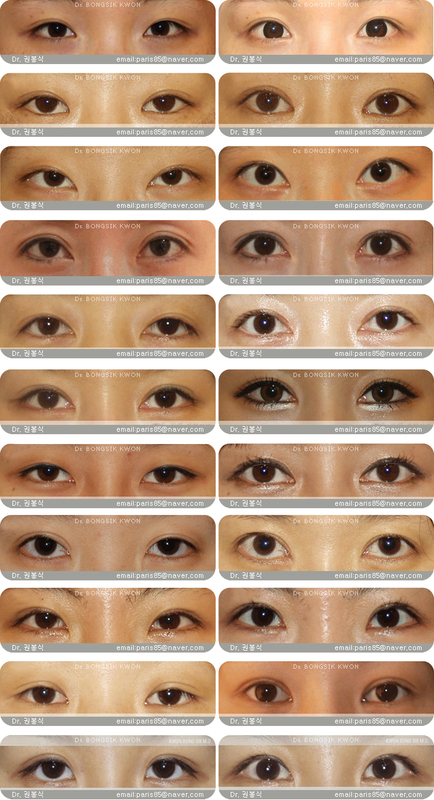 By combined surgery (Magic epicanthoplasty and double eyelid surgery), it can be improved them into an in-out or out-folder line. 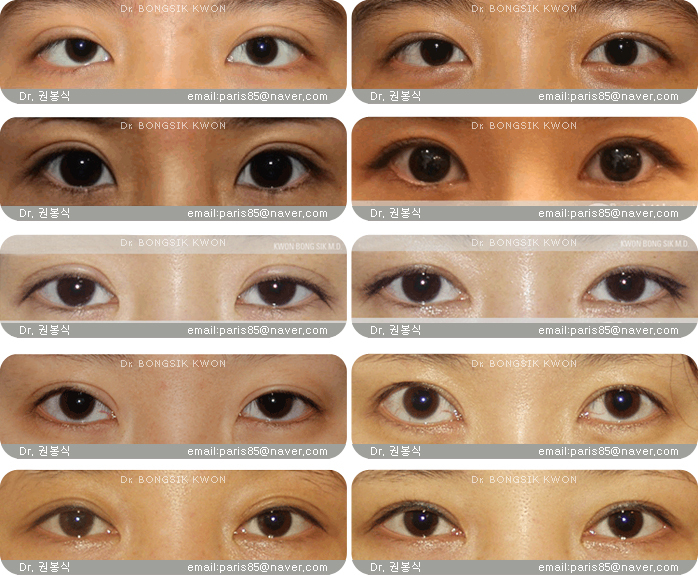 Examples) A case when the Magic epicanthoplasty and a partial correction of double eyelid are performed together. 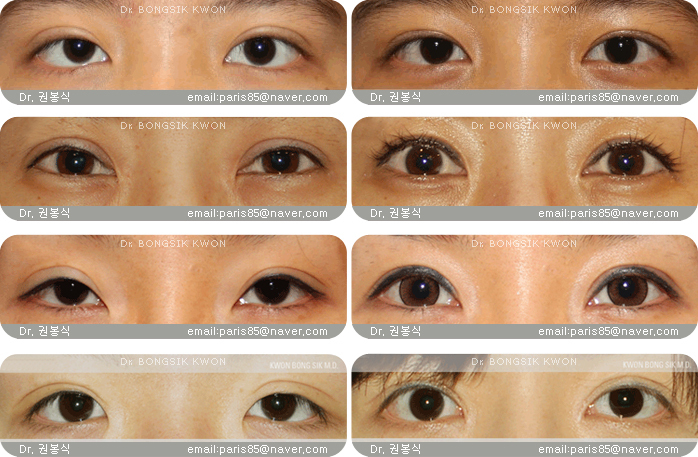 Examples) A case when the Magic epicanthoplasty and a total correction of double eyelid are performed together. When making out-folder in eyes with Mongolian folds, unnatural lines are made and they are likely to look weird on the inner corner of the eyes. Out-folder operation without the epicanthoplasty needs to be fixed firmly to prevent it from the loosening or fading. In these cases, the swelling remains longer finally and most of it becomes sausage appearance. Magic epicanthoplasty or combined revisional double eyelid surgery is needed. 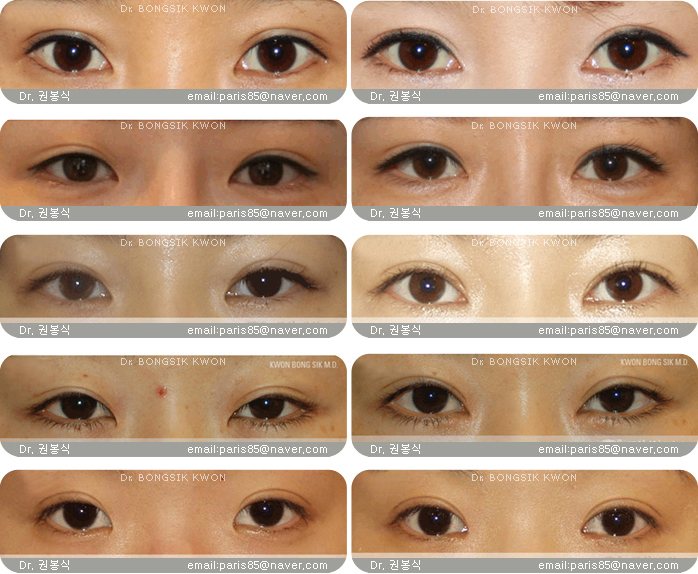 Examples) A case when the Magic epicanthoplasty and a revisional double eyelid are performed together. Although beautiful eyes can be made as swelling comes down, in some cases, revisional surgery should be considered. Patients often worry as soon as the stiches are removed. However, much time is needed after an operation or treatment and then it is possible to reconsider a reoperation at least 6 months after. Reoperation is divided into two parts. In one case, reoperation is performed as early as after about 2 weeks or about 6 months later. After 3 weeks from an operation, adhesion between tissues occurs and reoperation has to be done either before or afterward this happens. First, we can solve a problem early, before lines are fixed. This should be determined by the doctor. This is simply performed by a supplemental operation. The surgeon needs to have a lot of experience to be able to perform these operations. When a surgeon is not experienced enough, he would need to refer the patient to another doctor. This is also difficult because it is hard to find a surgeon that would take over the responsibilities without fully knowing the condition of the patient. Second, in general surgical knowledge, it is a principle to operate after swelling goes down completely, which takes at least 6 months. Methods or times differ based on condition, and it is desirable to determine it through a surgeon.